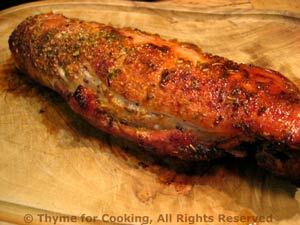 Thyme for Cooking's Main Courses: Shrimp, Brined Pork, Salads. This is a simple pasta dish. Without a proper 'sauce' all of the individual tastes come through clearly, creating a symphony of well-balanced, fresh, savory flavors. Trim and thickly slice green garlic, using as much green top as possible or slice green onion and mince garlic. Slice olives in half or thirds. Remove avocado from shell and cut into large cubes. Heat 1 tbs oil in a large, nonstick skillet. Add green garlic (or onion and garlic) and sauté briefly. Add shrimp and sauté until cooked through (they will turn opaque). 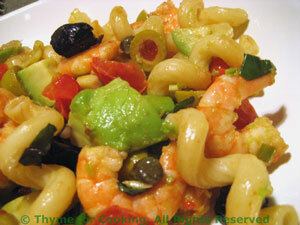 Add remaining 1 tbs oil, lemon juice, capers, olives, and tomatoes. Cook, stirring, until tomatoes just start to get soft. Add pasta, stir well to combine and heat through. Add avocado, basil and serve. This is a bit of a cross between a hot 'winter' pasta dish and a cold 'summer' salad. 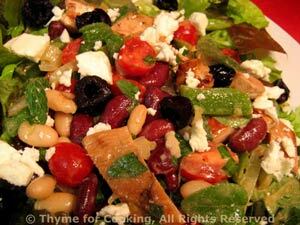 Lightly dressed with Balsamic vinegar, it has the taste of a salad with very little oil. Slice pepper into long strips, then cut strips in half. Heat 1 tbs oil in large, nonstick skillet. Add onions, peppers and sauté for 5 minute. Cut sausages into 1" (2.5cm) lengths and add to skillet. Sauté until cooked through. In a small bowl whisk together the wine, Worcestershire, vinegar and mustard. Add to skillet and bring to a boil, stirring to combine. Remove from heat, add pasta and herbs, stir well. 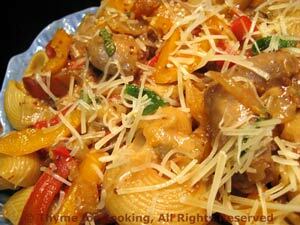 Put into a large pasta or salad bowl, sprinkle with cheese and serve. 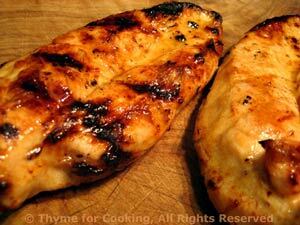 This is a simple marinade made with ingredients found in most pantries. The chicken is great as is, but will also be good tossed with salads or pastas. In small bowl whisk together Worcestershire, vinegar, oil, garlic and oregano. Pour over chicken and let marinate for 15 - 20 minutes or up to 2 hours. Cook on barbecue grill for 8 - 12 minutes per side or until done (test - take a peak), basting with any leftover marinade before turning. OR sauté in nonstick skillet for 8 - 10 minutes a side until nicely browned and done, basting with marinade. Slice if you like and serve. Ground ginger adds a bit of heat to this marinade, as does the garlic. Use between the 1/2 and 1 tsp, depending on your love of 'hot'. Boneless pork chops cook quickly on the barbecue, be careful not to over cook or they will be dry; a wee bit pink in the center is perfect. In small bowl whisk together the ingredients for the marinade - you need to use the whisk to break up the marmalade. 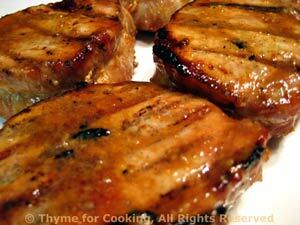 Pour over chops and let marinate for 15 minutes (or longer...). Remove chops from marinade and cook on barbecue 10 - 15 minutes turning once or under broiler for 12 - 15 minutes turning once - or sauté in large skillet 10 - 15 minutes (you get the picture). Baste with any remaining sauce before turning. In all cases it depends on thickness and test for doneness by slicing and peaking. Remove and serve.